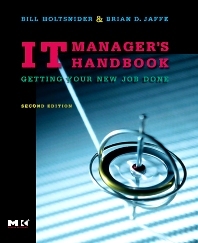 IT Manager's Handbook, Second Edition, provides essential information to help students understand the responsibilities of today’s IT Management professionals: not only planning network security and implementing disaster recovery plans, but also such vital tasks as creating budgets, administering compliance, and managing staff. In particular, the book discusses business practices that are most critical to effective IT operations: recruiting, budgeting, resource planning, managing personnel, and working with vendor. This updated version includes expanded coverage on such critical IT management topics as security, disaster recovery, storage, government/regulatory compliance, and project management. Information is organized modularly so that instructors and students can delve directly into only the topics needed. Each chapter contains additional resources sections for books, articles, and websites relevant to that topic. It contains new material on key technology topics such as open source, outsourcing, offshoring, and handhelds, plus updated coverage of e-commerce, remote access, intranets, and LAN/WAN management. A completely updated and expanded second edition that provides practical, easily accessible management advice written specifically for new IT managers: · Brings you up to speed on those business practices most critical to effective IT operations: recruiting, budgeting, resource planning, managing personnel, and working with vendors. · Includes expanded coverage on such critical IT management topics as security, disaster recovery, storage, government/regulatory compliance, and project management. · Organizes information modularly so you can delve directly into only the topics that you need. · Provides a unique management perspective on those specific technical issues with the most significant business ramifications. · Includes new material on key technology topics such as open source, wireless, handhelds, outsourcing, offshoring, and operations, as well as updated coverage of e-commerce, remote access, intranets, and LAN/WAN management. New IT managers in all areas of specialty, including technical professionals who are wannabe IT managers. Chapter One 1.1 Just What Does an IT Manager Do? 6.3 Lease versus Buy: Which One Is Better? Bill Holtsnider is an experienced writer, educator, and software professional with more than 26 years of experience working in the computer industry. His IT expertise includes working in such diverse areas as stock portfolio management, identity management, and software development. He is the author of six books and a wide range of technical and marketing documentation. Senior Writer at ClickFox with more than 26 years of experience working in the computer industry. Brian D. Jaffe is a seasoned veteran in the IT community. As an IT professional, he has worked for several Fortune 500 companies including Bristol-Myers Squibb, Time Warner, Philip Morris, and The Interpublic Group of Companies. Currently he is Senior Vice President for Global IT at McCann Worldgroup in New York City, one of the country’s leading advertising agencies. His articles have appeared in Computerworld, InfoWorld, eWeek, and The New York Times.